Okay, be honest, how many of you sang that line when you read it? Or perhaps you read it, got where I was heading, and then went back to hum it out? 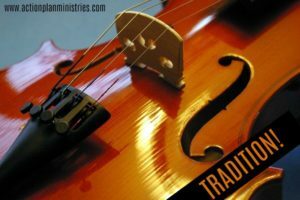 Tradition – a very popular song from a very popular Broadway musical turned movie. It’s that time. Mommy and Daddy are heading home from the hospital with their little one to begin a new, glorious life together as a family. Dreams are big and plans are many. The nursery is decorated, diapers are on standby, and the latest and greatest video monitor is plugged in and ready to go – assuming you’ll even let your baby out of your sight. You’ve got everything laid out, planned out, and figured out. And if not, well, love conquers all, and there’s enough love going on right now to assure victory in any battle. God is good and life is sweet. But reality doesn’t always mirror aspirations and success isn’t often achieved through happenstance. You are going to have to prepare your family and equip your precious bundle of heaven with useful life skills and tools necessary for the path ahead. That may be hard to envision right now. Thinking ahead to the toddler and adolescent years, never mind the faraway teenage trials, is the furthest thing from your mind. You’re likely more consumed with round the clock feedings, removing the yellow spit up stains from cutie-pie’s outfits, and squeezing in a few moments of shuteye, yet here I am sounding more like a General preparing her troops for battle. For now, you’d rather just stay floating on your cloud of sheer contentment. I get it. I really do. And I want you to enjoy every second of that experience. 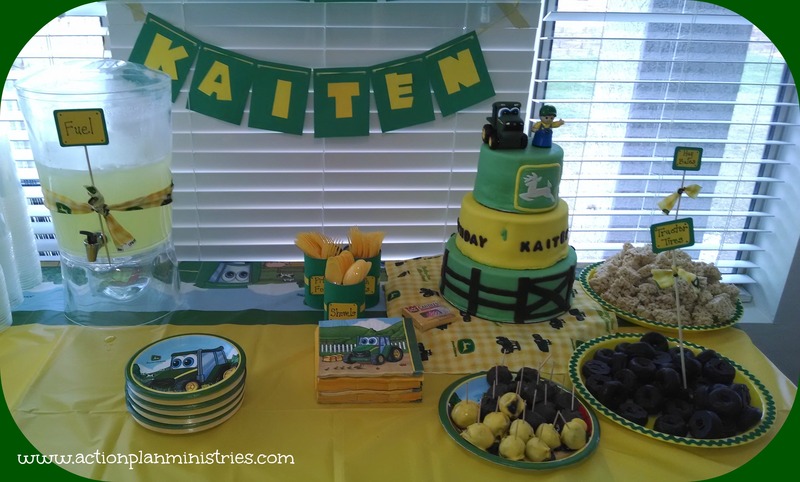 But you can’t deny hearing your friends lament about how fast kids grow up, and while you may not have personally experienced it yet, the anticipation of sending your baby off to kindergarten in a few short years produces a gargantuan-sized lump in your throat. The point? The days pass all too quickly and you’ve got to start laying out the foundation for your children’s future now. And this involves more than just teaching ‘please and thank you’, encouraging accurate aim at the center of the toilet, and coaching how to graciously eat horrible tasting food when staying the night at a friend’s house. You must teach them to declutter. Actually, teaching your kids to resist clutter in the first place is the best lesson of all! But in today’s world, this is no small task. It’s easy to get sidetracked and tempted by the unimportant. Consumerism is big business and every company on the planet is making it Job One to get your business. The hunger to rise up through the ranks for top dog salary or status is insatiable. We strive to be everything to everyone and suffer guilt overwhelming if we attempt to say ‘No’. Keeping up with the Joneses, or the Kardashians, is a full time job, and acquiring the newest and bestest toys and technology is irresistible. I’m here to tell you it’s not. Not by a longshot. I used to be a crazy woman, going Mach 10 in all directions, and squeezing every second possible out of each day. When my kids were younger, I rushed them around. Into adulthood, I bossed my sisters around. And in an attempt to keep up with life, I ran around. Everywhere. Shopping, sports practices, band concerts, Student Council events, Boy Scout meetings, playdates, doctor appointments, luncheons, workouts, coffee dates, etc. It was nonstop Go, Go, Go! In addition to my spastic pace, I stockpiled stuff for ‘security’, worked into all hours of the night, made decisions out of fear, and acted out of obligation. I thought I was Supermom, but instead, I was just Super Tired. Ironically, I was happy. Really happy. In the midst of the chaos, my heart was overflowing with joy. But ‘you don’t know what you don’t know’, and I didn’t know what I was missing. And I was missing a lot. Things have changed. After meeting and marrying the love of my life, I figured it out. Choices. Freedom. Wiggle Room. Guilt Free Living. Inner Peace. Abundant Joy. I’d been losing out on so much. Now I know. I’ve spent the past five years decluttering every aspect of my life and sharing my message of hope and happiness. For the young parents reading, I offer you knowledge and wisdom from my experiences…and from my mistakes. Give your kids the gift that keeps on giving and teach them to declutter from the get-go. Just like wearing a seatbelt, the non-negotiables easily become the norm when they are taught from the beginning. So teach away! Fire Your Child – Your baby shouldn’t be born with a job to do. Babies don’t fix marriages or personal problems, so declutter the notion that having a baby will ‘make it all better’. If there is work to be done, you and your spouse must commit to seeking help and taking care of business without leaning on your baby for support or putting them in the middle. They should get the very best you have to offer and it’s your job to make that happen. Kick Competition To the Curb – It doesn’t matter whose baby giggles, rolls over, or says ‘Momma” first. A competitive or jealous spirit will only breed discontentment. Declutter any desire to participate in this arena and simply celebrate your precious baby for exactly who they are. Take it Slow – Put the brakes on and slow down. Declutter the hustle and bustle of the rush, and instead, relish in every moment with your little one. Get on the floor and spend time on their level. Make outings to the store relaxed field trips. Remember, your toddler’s little legs are much smaller than yours and dawdling is naturally a two year old activity. Join them where they are and embrace a leisurely journey. As your kids get older, resist the urge to allow overcommitted schedules. It can be hard to say no to extracurricular school activities or fun events, but too much of a good thing ain’t so good. Help your child develop a culture of balance and thoughtful, healthy choices. Chat it Up – Some of the best conversations I’ve had in my life have been with my sons and grandchildren. Conversation and communication is so important, even at a very young age. Declutter the impulse to brush off their words or ignore monotonous babble and engage in dialogue every chance you get. Toys are Not Tops! – It doesn’t take long to realize that raising kids is an expensive venture. Parents go broke and wind up deeply in debt over spoiling their kids with ‘must have’ toys. Declutter the misnomer that stuff will make your child happy, and instead, instill a sense of imagination and inspiration by promoting creative play. Give my youngest a bowl of water, ice cubes, and a ladle at two years of age and he was happy for hours, as long as I refilled the ice cubes of course! Cardboard boxes and blanket tent forts were the bomb, and craft time was always a hit. It doesn’t have to be bright, shiny, and new to be fun. There’s a lot to be said for the freedom to color outside the lines. Guard Your Words – Both the manner in which you say something and the words chosen will make an indelible mark on your children. Declutter any inclination towards abrasiveness, criticism, and insensitivity. Strive to make interactions with your little one full of encouragement and praise. Positive, constructive words delivered with love can make the difference between a defensive and icy reception, and a child who respects and values the wisdom you have to impart – even if they don’t immediately admit it. Trust me, the payoff comes! Paying Attention Means Really Paying Attention – In this amped up age of technology, it’s easier than ever to be sidetracked. Declutter distractions that diminish your ability to be fully present for your children. Of course it’s appropriate, and even advisable, for them to have independent play time, and if you are talking with a friend, interruptions are unacceptable. In general, though, when you are in the company of your kiddos, afford them the courtesy and benefit of your undivided attention. Equip and Enable – Sometimes it just seems easier to do it yourself, but that’s rarely the right choice where your child’s responsibilities are concerned. Declutter disabling your kids by practicing tough love. Don’t be afraid to hand out fair consequences or enforce punishments. Don’t let them slip. ‘No’ today should be ‘No’ tomorrow and ‘No’ the next day. Teach your kids they can count on you to be consistent and love them enough to prove it. Whether your babies are just an exciting thought or are already here, NOW is the perfect time to start. Set them up for a life of purpose, contentment, confidence, and joy by modeling and teaching clutter-free living. Give your children the gift that keeps on giving – love them, equip them, and by all means, keep em’ decluttered! Those who are living unsavory lives certainly don’t want to be exposed. Their shame and secrets are safe with like-minded people. In protected circles, their actions will be applauded rather than challenged. They are encouraged to continue down a destructive path, as long as they return the favor to those around them. Don’t expose. Don’t challenge. Don’t speak truth. No guilt. No growth. No shame. Acceptance without work. Without effort. Without obligation. Without commitment. Without reproach. Have you heard these words before? These are nice, tidy attempts to keep the truth out. To let trouble continue on its path of destruction. To shield the truth from those who don’t want to be exposed. Who are not ready for change. It’s far easier to stay in the company of those who agree than those who don’t. So walls are built, relationships are abandoned, and trouble continues to find trouble. The cheerleaders in your life are essentially rooting for disaster. They’re not only watching the train wreck, but encouraging it. But it feels good. Temporarily. The support. The acceptance. Many of those who find trouble don’t even recognize that they are either (A) IN TROUBLE or (B) LOOKING FOR TROUBLE. Who might this include? People who make selfish and dangerous choices because they are lazy, irresponsible, and immature. People desperate to fill a void in their lives. They may be lonely, depressed, or hopeless. People in pain who attempt to mask pain and grief. Parents who make foolish decisions because they want to be liked. To keep the peace. Oh how the weak and misguided parents crave acceptance. So who looks for trouble? Unfortunately many do, whether intentional or not. Everyone from self-seeking individuals who just don’t care about anyone else but themselves to those in heart-wrenching, debilitating pain to those who just simply don’t know any better. But trouble still craves trouble. And it crosses all age, gender, educational, and socioeconomic lines. Trouble crosses all age, gender, educational, and socioeconomic lines. Is Your World Really All That Healthy? Unfortunately, many troubled people don’t see their lives as such. Controlled and bubbled off from opposition, they relish in feeling protected and secure. In their own homes, neighborhoods, and circles, they remain sheltered from disapproval and immersed in an environment riddled with denial. With those who insist they love…and care…and respect. But this is a façade and a farce. People who are unable or unwilling to speak truth aren’t necessarily the ones who care. Or who love you. Or who want the best for you. Or who are healthy for you. They’re using you…and you’re using them. And demons stay hidden. Years ago I was a ‘20 something’ Momma of two in a miserable marriage. I was a young Christian and didn’t quite understand what it meant to walk closely with the Lord. 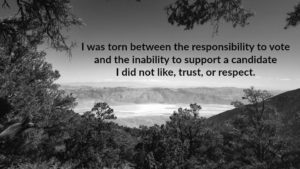 In spite of my spiritual immaturity, I knew some of the decisions I was making were wrong. My two closest friends at the time were, let’s call them, Mabel and Matilda. Mabel was my ‘Rah Rah Cheerleader’. She never challenged my behavior or choices and supported everything I did, right, wrong or indifferent. It was easy to be her friend and it felt good that in the midst of heartache and turmoil, I could count on Mabel for a non-judgmental and understanding ear. It was a relief to have one less person in my world to answer to. I could just be myself and it was always okay. Matilda was my straight-talking, no-nonsense, call it the way she sees it friend. I knew she loved me but she challenged my choices and made me think about my actions. Which I didn’t like. At all. I felt like I had to work for her approval. Even though I knew her opinion was based on God’s Word, I felt like I was being double-teamed. Yup, I had Matilda and God speaking truth into my life when I really didn’t want to hear it. So I did what any guilty, troubled person would do. I embraced Mabel and kept Matilda at arm’s length. Until I wised up and decided to get my life together. I committed to living for the Lord with integrity and purpose. I was tired of feeling guilty and ashamed and I knew I’d have so much more joy and peace in my life if I walked in obedience to the Lord. I wanted to do things right. And thank goodness for the wise, albeit harsh, words Matilda spoke to me. Sure, it may have taken me a bit to come around, but her words were imprinted on my heart and God used them in my time of healing and restoration. And guess where Mabel and Matilda are today? To be honest, I have no idea where Mabel is. Our friendship crumbled as I began to grow and thrive. And Matilda, well, she has been my best friend for just about 25 years now. Through life’s trials, disagreements, and heartbreaks, we have been there for one another and have seen each other through it all. Deeply devoted to our friendship in the most precious way possible, we remain steadfast by always speaking truth in love. We hit everything head on. No mincing of words, no stroking just to please, no rewarding bad behavior. I am eternally grateful for my ‘Matilda’! When I wanted to find trouble, I did. When I was ready to walk away from my stupidity, I did. The choice was mine to make. Just as it is yours. It’s ironic because those who are opposed to commitment are actually making a huge commitment to continue down a path of trouble; a promise to perpetuate destruction and heartache. Excuses are made and heels are dug in. And the obligation to trouble stays strong. But deep inside, the heart stirs and the truth gurgles. Buried under guilt and justifications, it’s barely noticeable, but it’s there. Faint and fleeting perhaps, but present nonetheless. Grab it and hold on for dear life. Make a decision to declutter trouble and restore true joy to your life. Consult God’s Word. Read and pray. Trust Him. “…God shall supply all your needs…” Phil 4:19 Let Him. When you are ready, with God’s help, you WILL succeed in decluttering trouble! As we roll closer to the New Year, my head is filled with thoughts of a prosperous 2017. What will I do differently? Improve upon? What should I continue? What should I toss? Or keep? Whom should I spend more time with? Less? What do I want to accomplish? How do I want to spend my time? What is truly important? 2016 wasn’t bad mind you, but there’s always room for improvement. What can I do to fill next year with more joy? More success? More meaning? More love? Stop Fixing and Start Living! When it comes right down to it, most of us know exactly where we fall short. We are acutely aware of the challenges that cause us to struggle. We know what hurts. What keeps us awake at night. What brings us anxiety and pain. And in most cases, we know what we need to do to fix it. Every single answer rests in God’s Word. He keeps no secrets and He doesn’t talk in riddles. It’s all there for the picking. God wants our lives to be spilling over with joy, success, meaning, and love, but we must choose to act. We must listen, discipline ourselves, and overcome. We must listen, discipline ourselves, and overcome. 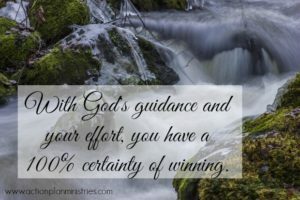 With God’s guidance and your effort, you have a 100% certainty of winning. The odds are forever in your favor. No maybes. No guessing games. No gambling. We can’t always control the situations and people around us, but we can absolutely control how we process and react. Caring what other people think. Saying ‘NO’ when I should. Trying to control everything around me. His Word tells me that I should concern myself first and foremost with what HE thinks. The world is flawed and people are sinful. To measure my standard by earthly inhabitants will only bring heartache, and in many cases, failure. God doesn’t want me wasting the precious, finite resources He’s so abundantly provided. He wants my time, energy, and finances used with purpose and care. Who is in control. Me? Of course not. The people around me who ‘seem’ to be in control? Nope. Ultimately, God is the only one in control of everything and I would do well to remember this when faced with a struggle. It is HE I should deflect to. HE is the one calling the shots and it is HIS Will that I must seek and petition. There is no heartbreak or disappointment that God cannot comfort nor any brokenness that God cannot heal. Why I beat myself up repeatedly lamenting over this is beyond me, but I do. UGH! With a ‘LET GO, LET GOD’ approach I have made significant progress with the first three areas of struggle. Number four, well, that is what I CHOOSE to overcome for 2017. I’m choosing to rest in God’s Word and in His provision. I don’t need a self-help book or 10 steps to tell me I need to check this one off my list. Sure, it’s okay, and even advisable, to gather helpful tools to aid your journey, but the truth is I KNOW what needs to happen and I simply must choose to do it. In spite of momentary struggles, I have every confidence God will bless my heart and effort. I know He will make the journey right beside me. I trust He will pave the way for more hope and joy than I’ve ever known. He WANTS my burdens at His feet. He desires I turn over my worries to Him. He promises to make ALL things new. Sometimes the road is bumpy. I get it. Human emotions seep in and overwhelm. We can lose focus and temporarily lose our minds. Boy howdy, have I been there! But recover quickly, refocus, and listen to God. There comes a time when enough is enough. When you’re sick and tired of being sick and tired. When the desire and determination to make life better is a stronger pull than resigning yourself to misery. With heels dug in and chin up, I am determined to follow Him. It’s time to stop fixing and start living! Go 2017! Go You! Go Me! I mean CHRIST should be in CHRISTmas, shouldn’t He? Would it surprise you to know I had NO IDEA ‘Christ’ was in Christmas until I started my faith walk in my early twenties? Don’t judge me! I honestly didn’t know. Someone once told me it’s the simple things that go right over my head. While the concept is simple, however, the execution is not and can go largely unmet, by Believers and non-Believers alike. How do we usually show Jesus? Anyone own a ‘Jesus is the Reason for the Season’ pin? I have several and make no bones about wearing them loud and proud during the Christmas season. I’m a Christian after all! And we display Jesus on our Christmas trees, right? I’ve got Bible character ornaments, verses, and nativity scenes on my tree. My favorite Christmas treasure is a beautiful angel tree topper which embodies the captivating spirit of the season. She lights up and holds a candle in one hand as her arms gently sway back and forth beckoning all to come. Oh how I adore her! Am I suggesting that pins, angels, and cards are bad? Of course not. Not at all! But are they enough? Is some Jesus better than no Jesus? Perhaps, but there are so many more blessings to be had, both personally and for those around you, if Jesus is given all the time, love, and attention you have to offer at Christmas. 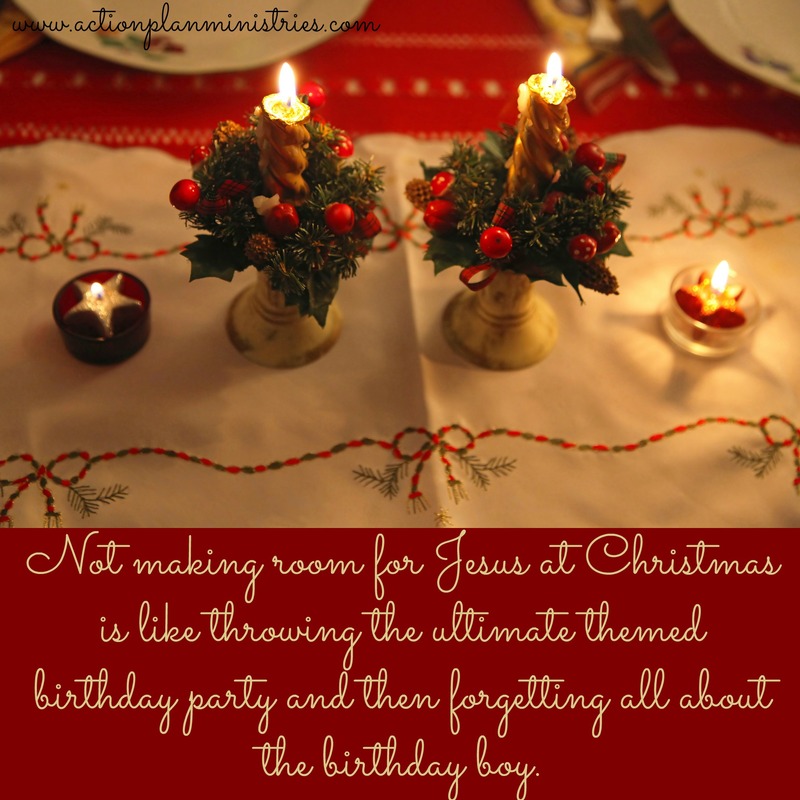 Might I suggest that not making room for Jesus at Christmas is like throwing the ultimate themed birthday party but then forgetting all about the birthday boy! Christmas isn’t about sharing remnants of Jesus or extending tidbit tokens, it’s about putting Jesus front and center in the celebration. Competing with friends, co-workers, neighbors, etc. Does Christmas become a catalyst for you to get wrapped up in your own desires or issues? To concentrate on what YOU want. Do you crave being the center of attention? Do you have underlying jealousy issues? 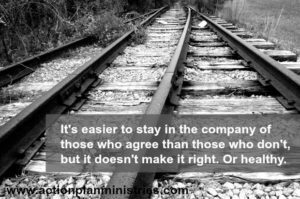 Do you suffer from discontentment? Perhaps you just truly enjoy spoiling people and blessing them with delicious food, thoughtful presents, and wonderful moments. Maybe this is simply your love language shining through in an effort to show love to those who mean the most. Well, if that’s the case, what better way to bless those very people than to share the love of Jesus in all you do by intentionally exemplifying Him in your actions and celebrations? Getting caught up in the temporal, materialistic, and surface stuff may produce a nice moment, but there are other ways to love on family and friends and enjoy wonderful moments which will impact them for eternity, rather than just for an hour or two. Growing up, I didn’t know Jesus. In fact, I came from a Jewish background. While some of my family members attended temple and kept Kosher, these rituals weren’t taught or practiced in my life. Consequently, the holidays became an odd mix of Christmas trees and Hanukkah bushes, Christmas lights and Menorah candles. The festivities centered around family, food, and fun. Not necessarily negative in and of itself, but certainly lacking truth and faith rooted in the birth of Jesus Christ. It took me awhile to get it. Even though I was saved in my early twenties, my spiritual walk and growth was a slow one. But slow and steady wins the race. Overtime, as I studied more, learned more, and deepened my relationship with Christ, the true meaning of Christmas was revealed. Far more than just a birthday celebration, it’s the story of God, who loved us so much, that he sent His one and only Son to earth to save us from our sins. And this wasn’t any easy journey. Jesus was born into a sinful world, faced extreme persecution and pain, and was ultimately sacrificed to atone for the sins of those who believe. Christmas is very special indeed. So how do we do this? How do we put Christ back in Christmas, glorify His Kingdom, and share His love? As you may have guessed, I’ve got some ideas on this too! Create Meaningful Moments – In the hustle and bustle of Christmas preparation, so much gets pushed aside. Unfortunately, those neglected items are often people and moments-to-be which, in the grand scheme of things, are far more important than the other stuff allowed to consume your energy and overtake your schedule. Take a step back, leave wiggle room on your calendar, and cultivate time for meaningful moments to blossom. Develop A Closer Relationship With Christ – It’s natural that we develop close relationships with those we spend the most time with. Jesus isn’t any different! Talk to Him, listen to Him, draw closer to Him, and ‘Be Still’ with Him. “Be still and know that I am God…” Psalm 46:10. Bring Glory to His Kingdom – Frankly, it’s the ENTIRE reason we are here. Our words, actions, behaviors, and service should all point back to glorifying His Kingdom. This is not only true for every single day of the year, but most certainly and especially for Christmas as well. Walk In Obedience To God – Sometimes rules and requests are looked upon as constricting, boring, or otherwise distasteful, but the truth is when you are obedient, there is often more peace, joy, and freedom found. Submitting to God’s Will for your life also gives Him the opportunity to bless you abundantly. Train Up Your Kids Properly – This one is a biggie parents. The responsibility to train up our kids is an enormous gift from God and one that we should take seriously. For your children, making room for Jesus at Christmas can come just as naturally as it is to say ‘please and thank-you’ and buckling their seatbelts IF it is modeled for them during their formative years. Give them the gift that keeps on giving and foster a Christ-centered environment. 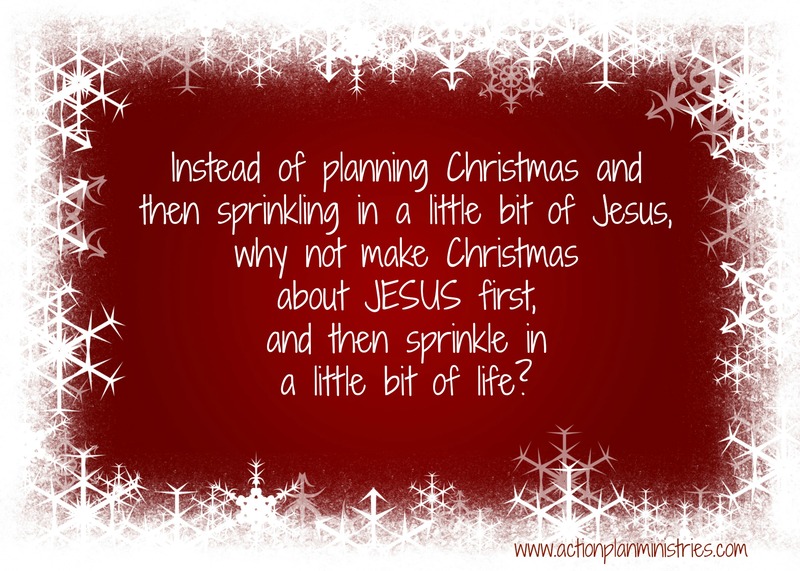 Instead of planning Christmas and then sprinkling in a little bit of Jesus, why not make Christmas about Jesus first, and then sprinkle in a little bit of life? Show Jesus by donating and performing acts of service. Emulate Jesus by simplifying and organizing for the Christmas holiday. Ditch any drama. Obey Jesus by practicing fiscal responsibility. If you’re going to shop, shop smart. Enjoy Jesus by embracing experiences. Have a ‘Mary’ Christmas and make time to sit at the Lord’s feet. Share Jesus by sowing into people’s lives. Share your testimony, speak truth in love, and extend invitations. Make room for Jesus by Inviting Him to Christmas. This isn’t just a physical invite, but a spiritual and emotional invite into your home, heart, and life. Invite Him to be present and participate in all that you do. THIS Christmas can be different. There’s always room for improvement, even in the best case scenario, so commit to making room for Jesus, putting Him front and center, and watch the true magic of Christmas unfold. Just 9 pounds to my fat self. To go from feeling fit and healthy to dragging like a sludge through life. Gaining just 9 pounds. Since I met my husband, Lindon, my weight has never varied more than that amount, but heck, that’s MORE than enough for me. I was actually 4 pounds lighter on our first date than I am now and in the not-so-deep recesses of my mind, this torments me. Up until last week, I had no intention of voting for the next President of the United States. ZERO! NONE! ZILCH! Morally, I just could not do it. But I was torn between the responsibility to vote and the inability to support a candidate I did not like, trust, or respect. Fear had won, although I didn’t see it as such until yesterday. Have you ever experienced a situation when someone was conveying one message, but your ears and heart picked up not only the intended message, but then something so much more? Our pastor gave an incredible message of hope. It wasn’t some generic, feel good, send-you-on-your-way kind of empty message, but one that had tremendous depth and meaning. Words of truth packed with a wealth of wisdom and practicality all rolled into one. A message that was intended to calm fears and restore courage and optimism. And it hit the mark. You see, I was ashamed to make a choice. I was scared that a choice would reflect MY character, MY nature, MY ideals, and I wanted NO part of that. It would have been easier not to vote and not claim any responsibility for whoever ended up in office. I didn’t want God to be disappointed in me for supporting a morally bankrupt person. I hesitated to make a decision, that if proved disastrous, would bring guilt and regret. But yesterday, through a message of hope, I realized that my thinking was skewed. Abstaining from casting a vote is akin to voting ‘for someone’, but relinquishing control of saying WHO that someone is. Whether I like it or not, by not voting, I am essentially voting anyway. And voting for a third party candidate who has no shot of winning is a similar decision. While initially, it may have felt like an honorable alternative, deep down, I knew it would have been a cowardly approach. Please don’t misinterpret. A third party candidate vote is NOT necessarily a bad decision, but for me to vote for someone I knew nothing about for the sole purpose of circumventing responsibility is. At the end of the day, while I have a huge lack of confidence in both candidates, comparatively speaking, there is one I dislike less. The right thing to do? Declutter fear and make the best decision I personally can. If decluttering fear was easy, we’d all be doing a better job of it. While I have a responsibility to cast a thoughtful vote, the outcome of the election does not rest on my shoulders alone. Taking a stand doesn’t mean I’m making the right choice or a perfect choice. There is strength in being able to make an unsavory decision. Regardless of what I do, there will be those who disagree. Fear is paralyzing and I refuse to succumb to this scheme of the Devil. God knows my heart and will love me through any decision I make. He knows I’m doing my best. The outcome of the election does not rest on my shoulders alone. Jesus is the ONLY ONE who can do ANY saving! If we are looking for a president to ‘save us’ or ‘save our country’, we are sorely misguided. As a Jesus follower, my hope is in the Lord. He ALWAYS prevails. Good ALWAYS triumphs over evil. And it will ALWAYS be okay. Might there be some bumps in the road along the way? Sure. Of course there will. But I know the END of the story and it is good. Very, very good. My hope is in Him and Him alone. Need a little more convincing? Take a listen and allow the truth of these lyrics fill and soothe your soul. I am voting for Trump. My declaration is not an effort to win or sway votes, however after making this decision, that would be okay too. And it’s not out of obligation. My admission is actually part of my healing process; my determination to overcome fear and live by faith. It’s cathartic and liberating. It’s necessary for me. Regardless of who you decide to vote for, my prayer is that without fear, you will indeed cast your best vote, having full faith that our Lord Jesus Christ remains in control regardless of who is sitting in the Oval Office. I was seriously depressed for a day and a half. Before you roll your eyes, start laughing, and make fun, hear me out. I’d never felt depression, nor could I relate to it, so this was an eye-opening, profound learning experience. Brief as it was, it made a lifelong impression. Some years back I was working through an extremely difficult situation. I was challenged by God to change the way I regarded my ex-husband. I was often quite critical of him and never viewed him through Christ-filled eyes of love, mercy, or grace. I’m not proud of this, but it’s the ugly truth. I could rationalize and say his actions earned my harsh judgment and I was justified, but even if true, his behavior shouldn’t have dictated how I, as a Christian, behaved. Ephesians 4:32 tells us to be kind and compassionate to one another; forgiving each other, just as in Christ God forgave you. This verse doesn’t tell us to be kind IF the recipient deserves it or has earned our respect. Nope, God just directs us in how we are called to act with no qualifiers attached. Are y’all lining up? I’m confident there’s a crowd forming. After just celebrating my most recent birthday, I can now say I’ve got fifty years’ worth of time accrued offending, hurting, and otherwise ticking people off. Well, perhaps not quite fifty. I’m sure I didn’t do much damage in my first few years on earth, but when I got the hang of it, seems like I made up for lost time. Today I ask for your forgiveness. Maybe. Not fully recovered from jet lag, I’m still trying to get back in the swing of things just three days after returning from a ten day vacation. It was lovely and wonderful and all sorts of cool. We saw incredible sights, hiked, snorkeled, dined on delicious food, shopped, and enjoyed a bit of adventure too. And guess what? When we came home, the only thing we brought with us were memories and souvenirs, NOT DEBT! Our entire trip – flights, accommodations, transportation, food, tours, gifts, and entertainment – was all paid for with cash. No, of course we didn’t traipse around with thousands of dollars in our wallets, but we had the money for everything we bought. And it felt good. Actually great! We packed a lot of things for this trip, but guilt wasn’t one of them.